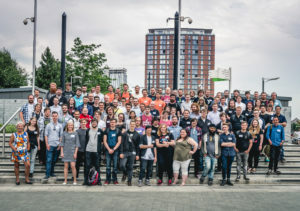 The 23 teams taking part in this year’s Tranzfuser competition recently gathered together in the heart of Media City (Salford) to take part in the inaugural TALK Tranzfuser event; the first opportunity for the 2017 cohort to connect, learn from one another’s experiences so far and find out more about the exciting opportunities ahead in the competition. 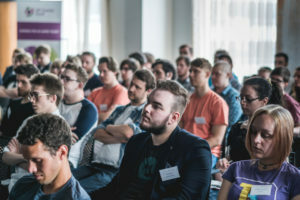 TALK Tranzfuser allowed the teams, many of whom are completely new to professional games development, to learn from veteran games developers and past participants of Tranzfuser; topics highlighted included the typical journey of going from a graduate team to a fully-fledged business, key learning from Tranzfuser 2016 from the perspective of a participant and how the 2017 cohort can expect to be assessed over the course of the competition. One of the most important outcomes of the event was to have teams leave feeling more prepared to succeed in the competition. 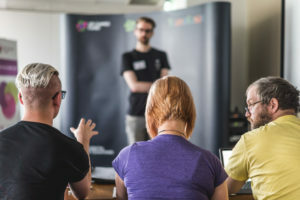 To help them achieve that, teams were tasked with each pitching to different games development professionals (all being part of the Tranzfuser competition review panel) detailing progress to date and expected developments to come with a window of no more than 5 minutes per team. As challenging as this likely was for the teams – pitches were held in open spaces – the opportunity for learning from the experience and feedback given was invaluable at this critical stage in the competition. Wrapping things up, Colin Macdonald (Games Commissioner at Channel 4) gave the audience his expert view on how games development has evolved over the years and, excitingly for attendees, his assessment of opportunities for those coming into the profession. The next time the Tranzfuser 2017 teams get together will be at this year’s EGX event in what will be the competition’s key showcase finale. In the meantime, all 23 teams are busy working on their projects to be demonstrated to the public in September but regular updates are being shared over on Twitter. Follow @ukgamestalent for all the latest information on how things are going.